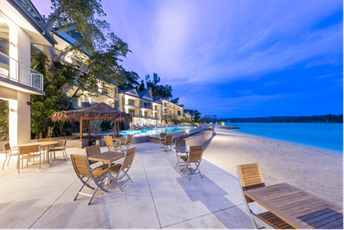 Ramada Resort > Save up to 50%! Package Inclusions & Benefits: 5 Nights, daily buffet breakfast,Complimentary snorkelling equipment, kayaks & stand-up paddle boards,Complimentary Wi-Fi up to 500mb per room per day. Bonus Celebration Inclusions: 90 minute Erakor Lagoon cruise for two,$40 "Celebration Credits" towards food & beverages per room per stay. Family Bonus: Kids eat free up to 12yrs when dining with two paying adults,Free access to the Kids Club (3-12 years) during stay including daily activities & Kids Lunch,2 hours Babysitting Nanny service for up to 2 children (u/12 yrs) once during stay. Contact us for package prices including air fares with Virgin Australia. Introductory special land package prices from $699 per adult twin share and $27 for one child u/12 yrs when sharing one Junior Suite with two adults, and from $1270 per adult twin share and $27 each child u/12 yrs (max. 2 when sharing with two adults) in two interconnecting Junior Suites, valid for stays between 15 July, 2018, to 31 March, 2019, excluding 20 December, 2018, to 07 January, 2019. All prices shown are in Australian Dollars and subject to change due currency fluctuations or changes to Govt. taxes. Subject to availability.